Welcome to 2012. 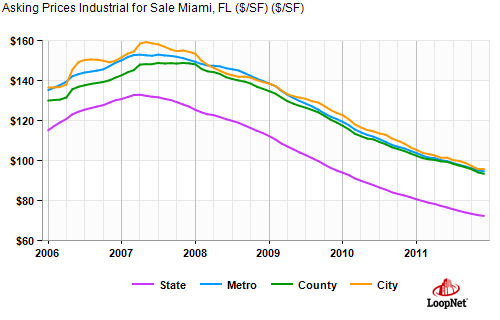 The Miami industrial real estate market continued its steady growth and improvement in 2011. In the past quarter, the vacancy has fallen once again to 7.9% while the lease rates have increased to an average of $7.21 per square foot. The national averages in comparison are now 9.5% and $5.11 per square foot, respectively. Obviously the driving force in Miami is its trade routes and relationships with the international community; especially the Caribbean, Central and South America. Users continue to acquire the more efficient and functional, Class A and B warehouse buildings that are priced according to market values. Class C properties continue to sit idle or will have to be re-purposed later by users or investors. The force is shifting again from a “buyer / tenant market” to a “seller / landlord market.” Pricing is increasing as the vacancy rate is decreasing. Landlords are offering less rental abatement and tenant improvement allowances. For tenants, it might be a good time to secure lower lease rates this year by extending the term of their lease. In ComReal’s prior quarterly report, we wrote about the improvements to the transportation infrastructure throughout Miami-Dade County. In addition to the publicly funded developments, the biggest news for 2011 overall was the announcement of the new construction of seven class A warehouse projects (see the below chart), by mostly institutional developers. Some of the state of the art features in the new industrial parks are the 28-30’ high ceilings; over 50’ column spacing; ESFR sprinklers; T-5 lighting; concrete loading aprons with extra large truck courts; and more. These are literally concrete signs of the confidence by both the public and private sectors in the Miami industrial real estate market, along with our local economy. Although one must keep in mind that most of the above-mentioned construction is being done on a speculative basis. The one exception is the custom-built, partially-refrigerated facility for Centurion Logistics. Property Name Location Size in Sq. Ft.
Cooler Warehouse Space in Miami is Hot! In 2012, whether users will be looking to lease or purchase a warehouse in the Airport West submarket, they need to be prepared that their options might be limited. Not long ago, when searching for a warehouse in Miami, there were dozens of options to choose from, and now one would be lucky to have more than six options. With limited possibilities, a user should start their search at least nine months prior to their needed move-in date. This period will allow for the time it takes to identify possible locations plus the negotiations. Be sure to allow from four to six months additional for any new construction or build-outs due to the permitting process. 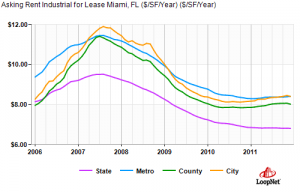 If you are looking to move anytime in 2012, now is the time to start by contacting your Miami Warehouse Team. We participated in over 700,000 sq. ft. of warehouse sales and leasing transactions in 2011. We look forward to the opportunity to work with you in 2012 and beyond. • The market activity seems to be very intense right now, however we may expect a severe slowdown as business owners wait for the result of the US Presidential election. • New Yorkers and Californians are moving their businesses to Florida due to a better quality of life; we are a right to work state; and there is no state income tax. (One recent negative is that our minimum wage just increased above the national average). 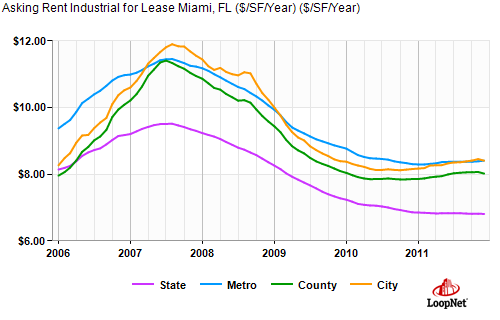 • Vacancy of warehouse spaces may likely continue to decrease through mid-year, until the new construction comes online. • Thieves (often ex-contractors) continue to vandalize vacant, unalarmed properties to steal copper, sprinkler heads, A/C units and anything else they can make a few bucks on. Law enforcement is struggling to prevent it, let alone catch the thieves. This is a severe problem in Miami-Dade County which goes largely unreported by the local media and uncontested by law enforcement. What makes the matter worse is the County’s troublesome permitting process to get the property operational again after the incident. • More properties may be purchased this year than the past several years prior since financing is available for borrowers with good credit acquiring commercial real estate. The property should be in good condition and priced within current market values. Although the users will have a much easier time obtaining a loan than investors.